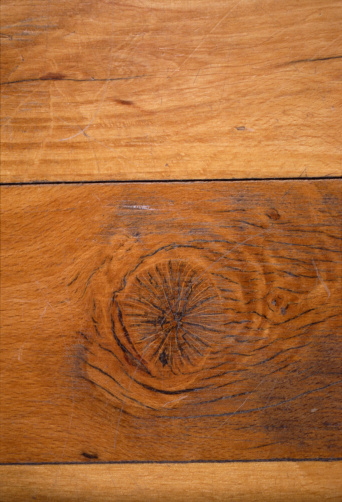 Polyurethane hardwood floor finishes come in two varieties: those from the factory and those applied on-site. The former is usually the more durable of the two. All polyurethane finishes are water-resistant, but flooring professionals advise using water sparingly -- if at all -- for cleaning. Polyurethane finishes usually don't require deep cleaning often, but when they do, a pH-neutral cleaner is best -- although vinegar, which is acidic, helps with problem stains. Factory-finished polyurethane has already cured by the time the floor is installed, but if the floor is finished on-site, the coating needs two or three weeks to cure before you can safely clean it without scratching it. The floor doesn't need frequent washing, and you should never use wax, which would just make it dangerously slippery. Your regular cleaning regimen should include sweeping with a a soft-bristle broom and occasional vacuuming to remove debris from cracks and joints between boards. When vacuuming, use a soft attachment -- preferably a hand-held one -- and turn the beater bar off. Both factory and on-site finishes leave the wood vulnerable to moisture if the coating is worn. Even when the coating is new, you should never leave water standing on it. 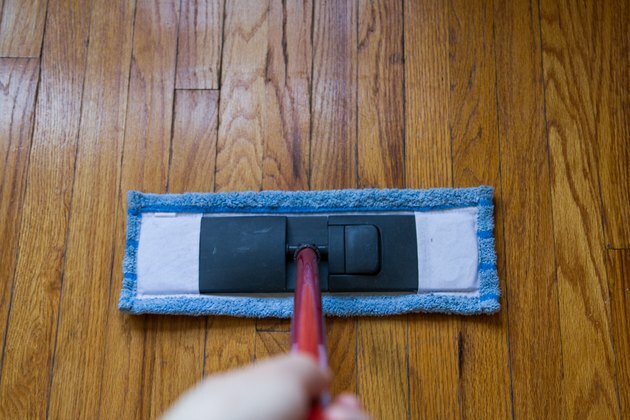 If you don't have a hardwood floor cleaner (which is the recommended solution), damp-mop the floor with water or a mixture of water and dish-detergent. One ounce of detergent per gallon of water is a safe mixture. Use a microfiber or sponge mop, taking care to wring the mop out thoroughly before each pass. 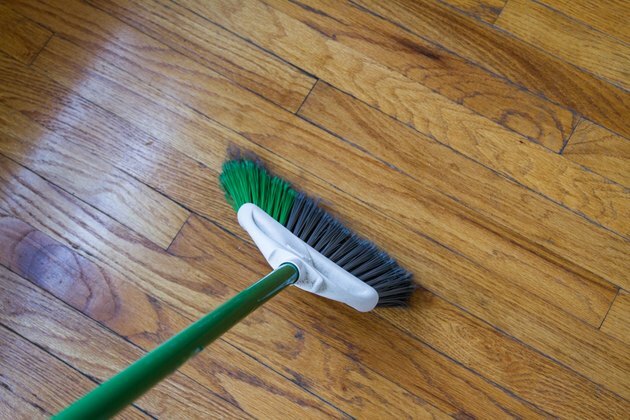 Mop with the grain of the wood to avoid streaks, rinse with clear water and dry with a a rag. Low-pH cleaners can dull a polyurethane finish, but some stains need more cleaning power than water and dish soap can provide. 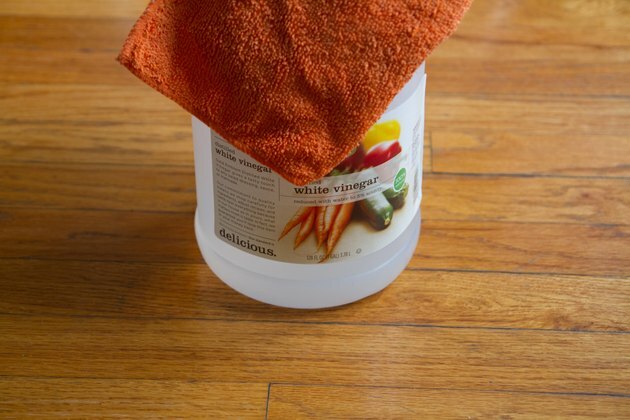 Vinegar is mildly acidic and can cut through white mineral streaks, so adding a 1/4 cup or 1/2 cup of it to your dish-soap cleaning solution will create a good treatment for a floor that gets a lot of foot traffic. Test the solution on a small spot first, especially if the finish is brand new and shiny, and you want it to stay that way. When using vinegar, it's best to mop the floor in sections so you can rinse immediately after washing. This will minimize the possibility of dulling. Even though polyurethane is one of the most durable floor finishes there is, it wears out and eventually needs more than simple cleaning to restore its luster. 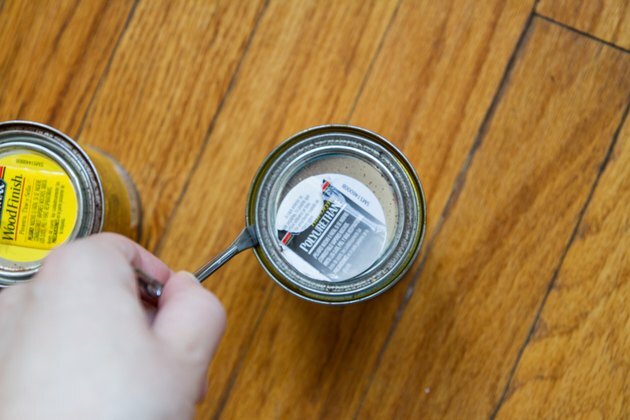 Refinishing should be a last resort. Before you get to that point, you can restore the finish by wiping on a finish-restoring product or even a new coat of finish. 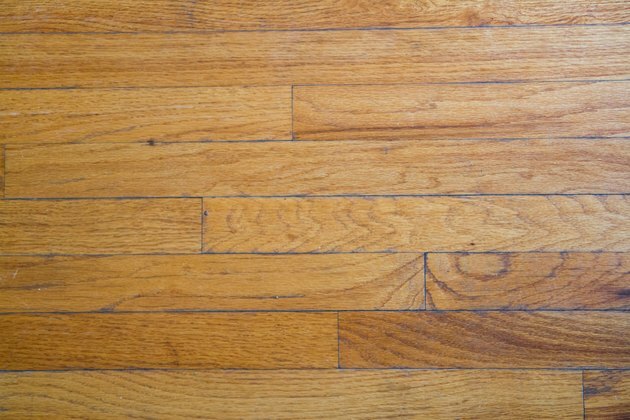 If you're thinking about doing this, consider also screening the floor, which means to scuff it with a floor buffer and a sanding disk. The one-day procedure, called screening and re-coating, can give the existing finish several more years of life.